Crows with bad legs or feet are more common than you might think. I have several in my neighborhood of West Seattle that I have tracked over the years. This last couple of weeks I have seen a youngster limping around our parking lot. I finally got a few photos of him to share. More important than just finding another poor disabled crow is the fact that their gimpyness allows me to recognize them. How do you tell crows apart? It is near impossible since they all wear the same black suit and have very few distinguishable markings. Over the years I have tried to figure this out and wrote two articles on the subject. All I got to say is good luck with telling them apart. Do you know that crow? 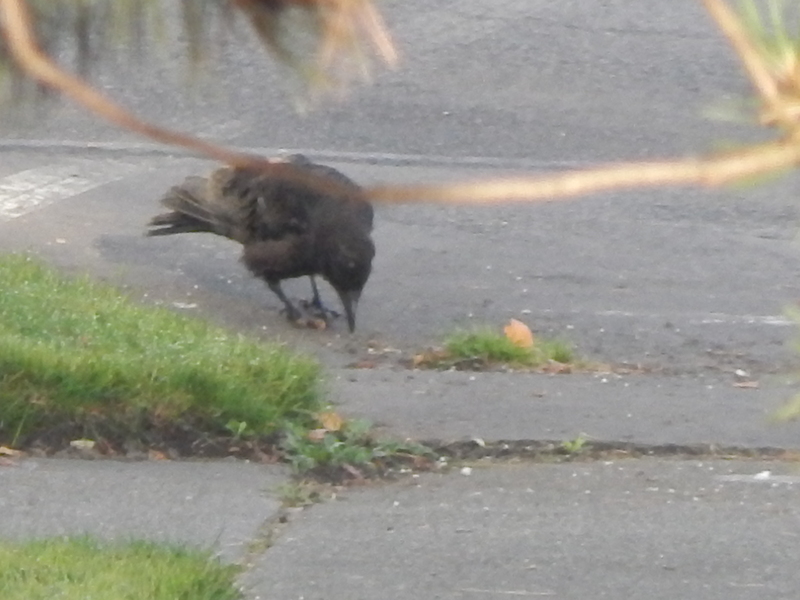 So, back to my local Renton crow that I can watch limp around from my office window. He does seem to be in bad feather since it is molting time. That could be made worse by his not feeling that great. This somewhat fussy photo shows his foot with what seems like white stuff. That is a form of avian pox that can be nasty. Since the photo is a bit poor I am not 100% sure if that is the problem. So.. more to come on that. Don’t feel too sorry for this little guy. Other gimpy crows I have tracked are surviving year after year and even raised families. This crow has not lost all use of his left leg like one I know on 39th Ave SW. He can still get around on it which means he has a good chance of making it. Here is a very short video showing how his gait looks. Keep your eyes open and you too will see nature and wildlife at your doorstep.